The last few years have seen a huge wave of regeneration sweep through Hesters Way. Some of the more unattractive blocks of flats in the Shakespeare Road and Goldsmith Road areas have been demolished and replaced by new houses. Cheltenham Borough Council has plans to demolish several more blocks including Holst House, Novello House, Sullivan House, Britten House, Canada House, Montreal House and Quebec House over the next couple of years and replace these with houses, and tenants of Sochi Court are being consulted as to whether they wish their block to follow. Meanwhile, many of the smaller blocks of flats along Princess Elizabeth Way have had major facelifts in the last few months, and as I write several more are undergoing the same. In doing so planners have transformed some of the eyesores that were the legacy of post-war haste, into attractive buildings. New traffic furniture and designer bus stops seem to be appearing daily. The whole appearance of the estate is changing at a rapid rate. As we approach the millennium, there are several more building projects in the offing, which will make Hesters Way unrecognisable from the estate of a few years ago. 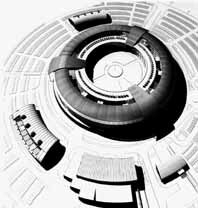 Any day now work is scheduled to begin on one of the world's most stylish and high tech buildings, as GCHQ replaces its fifties spy base with its post-modern 'donut' building (see illustration opposite). In February 2000 the former Monkscroft Senior School site that has been empty for five years will spring to life as work begins on a new community resource centre which will become the new headquarters of Hesters Way Neighbourhood Project and a number of community businesses. The centre will also enable many new services to be brought on to the estate. A new youth centre and a new police station are also planned for the site. Alongside this development, if plans go ahead, Gloscat are to build a massive �15 million new mall style college complex, which will house their entire Cheltenham operation, which presently is at several sites across the town. This they hope will be completed by September 2002. Apart from providing much needed employment to the area, these new projects are certain to increase the whole profile of Hesters Way in years to come. With many organisations including Cheltenham Borough Council, Hesters Way Partnership and Hesters Way Neighbourhood Project committed to regeneration of the estate, the outlook for Hesters Way going into the next millennium is one of positive optimism. Thank you to all those who have communicated their thoughts on these publications. Not every enquiry has been followed through. Those of you who have unusual or long memories of the area, or opinions as to subjects we have neglected, could put your thoughts into writing. Hesters Way Neighbourhood Project would love to hear from you.